If you’ve happened to bring your one-liners to Copenhagen you have a chance to join the popular Friday Night skate event through the city. Check the Facebook page here for updates. Children of all ages enjoy free open-air puppet theatre shows in the small theatre in the King’s Garden located by Kronprinsensgade. Performances: Tue-Fri at 10:00 and 11:00. Info on Facebook here. Exhibitions and workshops. 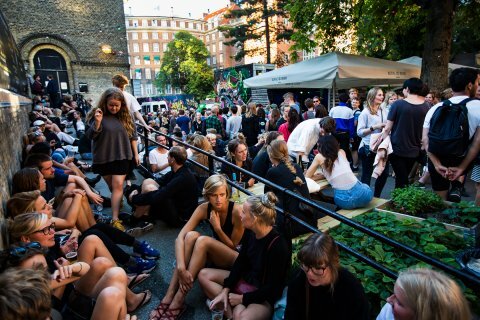 The main venue is in the Østerbro neighbourhood – a chance to visit one of the city’s less touristic districts. Info here. Outdoor barbecues, deejays and sports car show. The event takes place by the waterside at Nordre Toldbod 12:00-19:00. Info here. The annual open-air performance is staged on the Ofelia Plads wharf next to the Royal Danish Playhouse. Info and tickets here. Opening of the summer photo exhibition at the world’s first mooning gallery. The exhibition celebrates the 800th anniversary of the Danish flag. Copenhagen’s heavy metal festival in the city’s former shipyard, Refshaleøen, features a concert program of big-ticket growlers. The event generally sells out fast. Info and tickets here. The midsummer solstice has been celebrated in Denmark since time immemorial. Today the Midsummer Eve celebration is called Sankt Hans (Saint John’s Eve). Bonfires are lit along the beaches and in the city’s waterways, such as at Nyhavn Canal and Christianshavn Canal. The fires are usually lit at 21:00 after a communal singalong.